Having exited the Moonies in 1976, following an intervention performed at the request of my family, I have been so grateful to regain my life. I refer to the group as “the Moonies,” because when I was a member, the term was initially coined and Sun Myung Moon loved the term. We even wore tee-shirts and had mugs made with “I Heart the Moonies.” When Moon was convicted of conspiracy to defraud the Federal government and filing false income taxes, resulting in 13 months jail time, a PR campaign ensued costing, from my recollection, an estimated 30 million dollars. This branded Moon as a persecuted preacher from Korea. They started criticizing anyone who used the term Moonies and referred to the term as the “n” word used with African-Americans. Not. I do not wish to play by their propaganda rules. 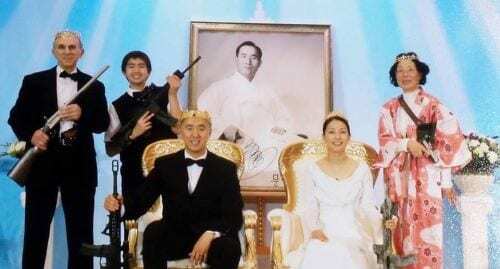 Last year, I blogged about the group, but recent events motivate me to write this blog about Hyung Jin Moon and his mission to take over the world using guns. Moon’s new www.rodofironministry.org is hosting a “thank you” dinner for Trump, who they claim they helped to elect as U.S. President. It was difficult but I listened to “the King’s” sermon and learned that the old mission–to take over the world–is still being espoused. But the big difference was the repeated showing of a graphic of America composed of images of guns-something that Moon wanted to keep low key back in the 1970s. The talk was pretty pathetic and would never recruit anyone new. It seemed clear that it was aimed at people who were still indoctrinated, reinforcing the belief that Sun Myung Moon was the Messiah. Sad. lifetimes, they amassed fortunes estimated to be in the billions of dollars. In the case of the Moon group, “True Mother” Hak Ja Han and several of her sons are reportedly fighting–vying for power and the fortune. With Transcendental Meditation (TM), I am aware of the filmmaker David Lynch’s foundation’s well-financed efforts to recruit a whole new generation of devotees which is very concerning to those who are intimately familiar with the dark side of TM. 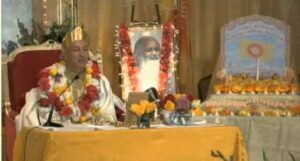 Millions of people have been tricked into being initiated into TM, not understanding the covert commitment to Hinduism. They paid their money, got the secret mantra (not so secret) and, in some cases, continued the 20-minute meditation practice without doing the follow-up or taking the advanced courses. In other words, they were lucky that they did not get sucked in further. If you look at this graphic (from chapter 3 of the 2015 edition of Combating Cult Mind Control) it helps to illustrate that the largest number of “followers” are outside the base of the pyramid. Most people who have done TM did not pay the thousands of dollars to learn how to hop, walk through walls, or become invisible, which were some of the original claims for the special siddhis Maharishi offered. But if you are one of these people, I wonder if you still have the phobia to never share your secret mantra? 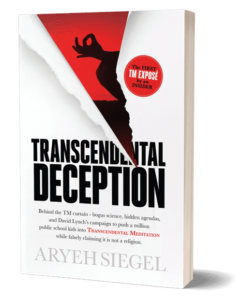 Former teachers, like Aryeh Siegel, have pulled back the curtain on what is really going on. I highly recommend reading his book. If you are a celebrity, I suggest you think twice before accepting money to promote this group. On February 9, 2018, Brenden Joel Kelley, as part of SPLC’s Hatewatch blog, released a timely article discussing the Sanctuary Church’s blessing ceremony at which members were encouraged to bring their AR-15 rifles. My insights about this group and ceremony, along with my experience as a member of the Moon group (Unification Church), are included. Why the Reported Sale of the Moonies Washington Times for $1 Requires Greater Scrutiny!